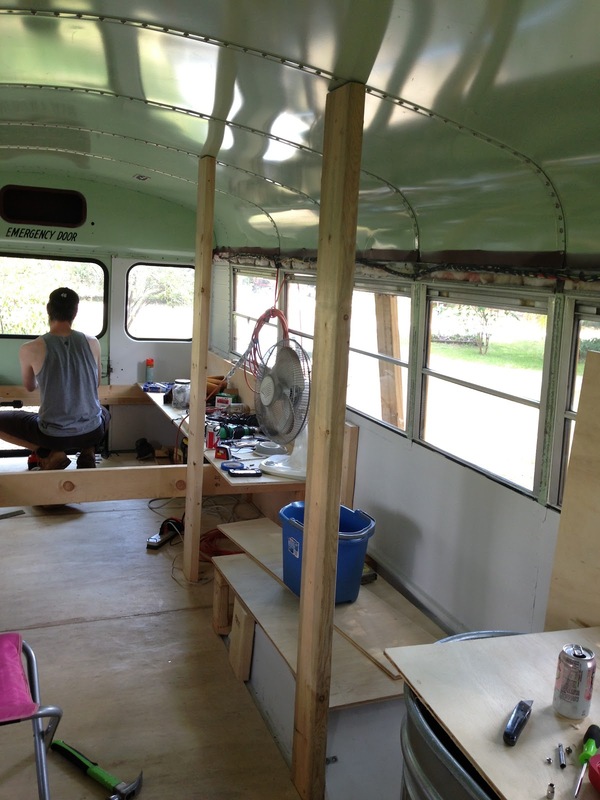 We've been very busy working away on the bus and apologize for the delay in posts. For frequent updates be sure to "like" us on facebook, as I update there almost daily. 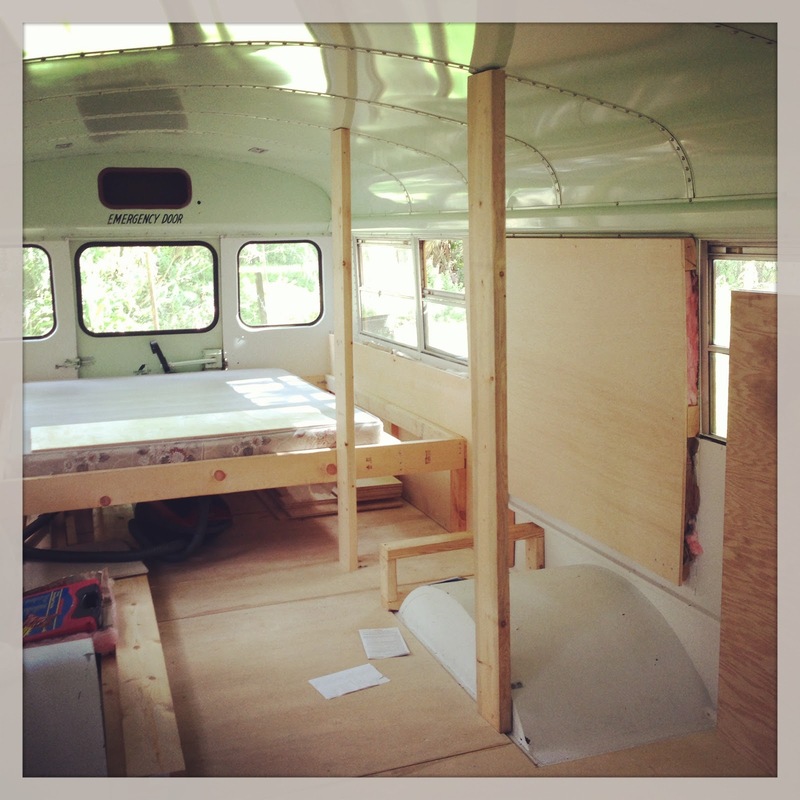 As you may know, we started building at the back of the bus with the bed and are working our way forward. It's been interesting and we've made more than one mistake but we are figuring things out as we go. It's really hard to stop and remind ourselves that planning 2-10 steps ahead will keep us from having to go back and redo areas we already completed. Alas, sometimes just "doing something" feels better than thinking about other things that we aren't sure how we're going to do yet. 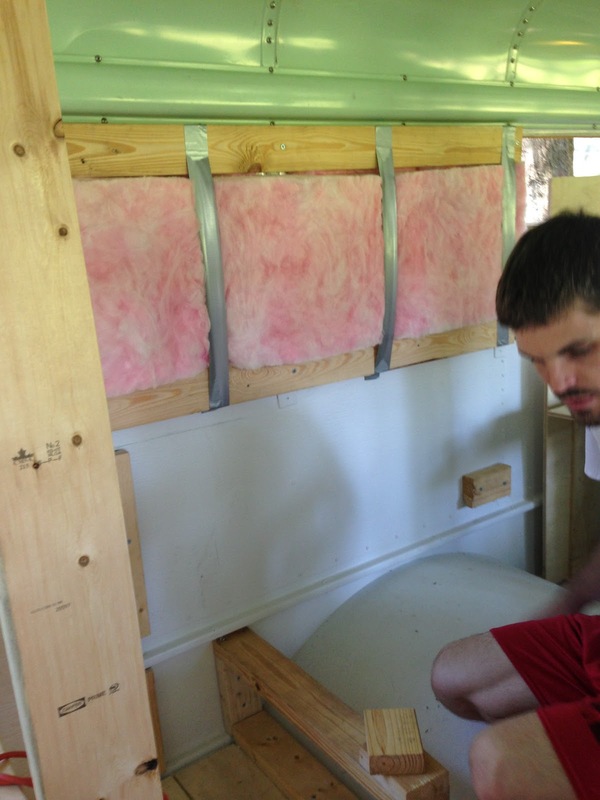 We framed out the bed and mounted it on the walls at the "just right height" so our water tank will fit underneath. 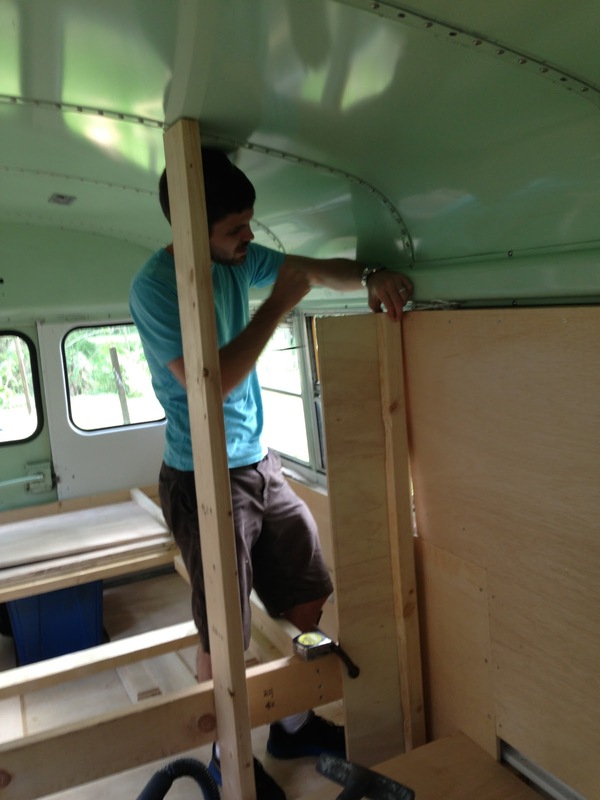 We'll have storage in the back, accessible by the back doors, and we'll make drawers for the front. 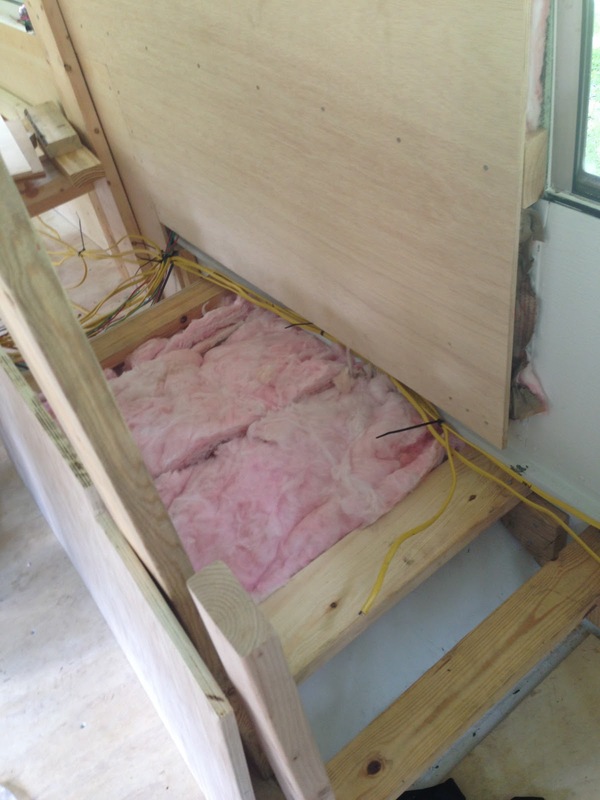 On top of the bed frame are 3 pieces of 3/4 inch plywood that can be lifted up and slid to one side to access the area underneath. 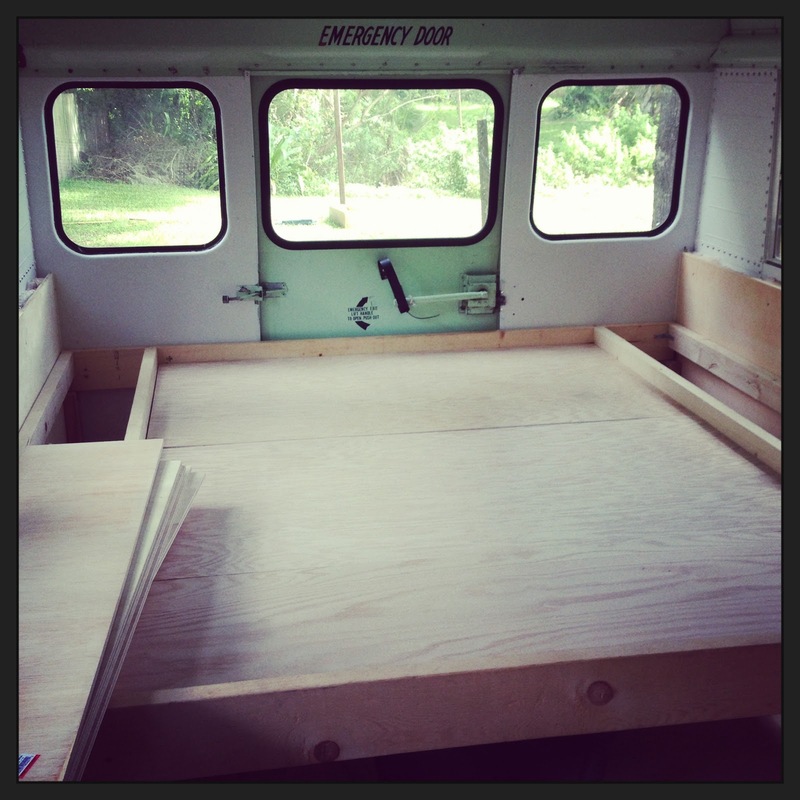 They won't provide as much support as a box spring, but we think they'll be comfy enough. 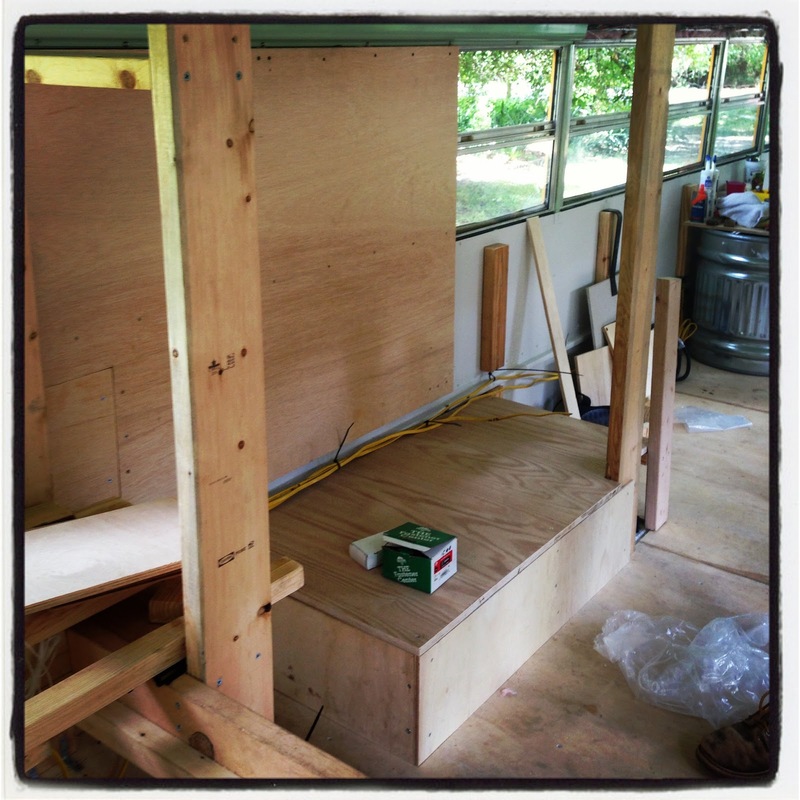 Here are the 3 pieces of plywood in place. 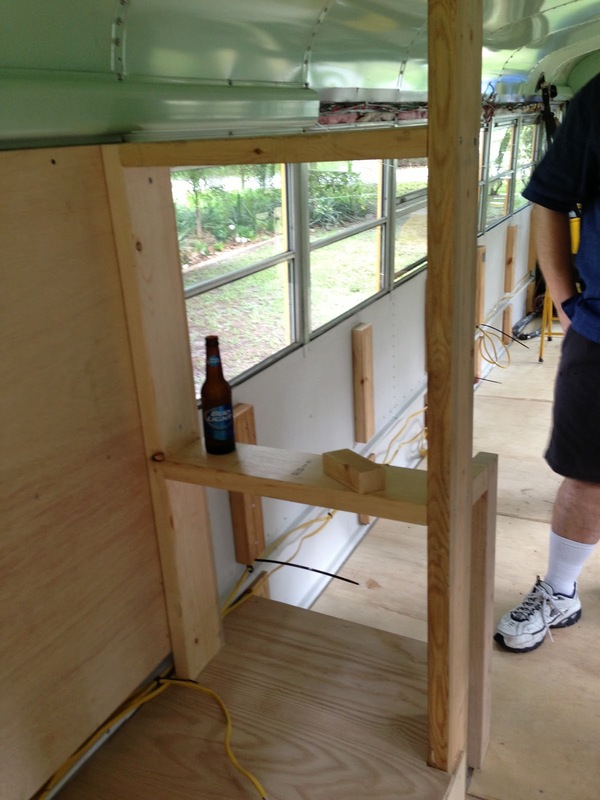 We also built most of the closets over the wheel wells. 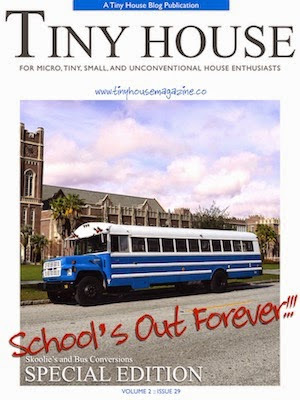 This was an interesting challenge as the bus is not a perfect rectangle like a house. It has a curved roof, slanted walls and is not level in the yard. We threw the level away on the first day of the project, as it was useless. 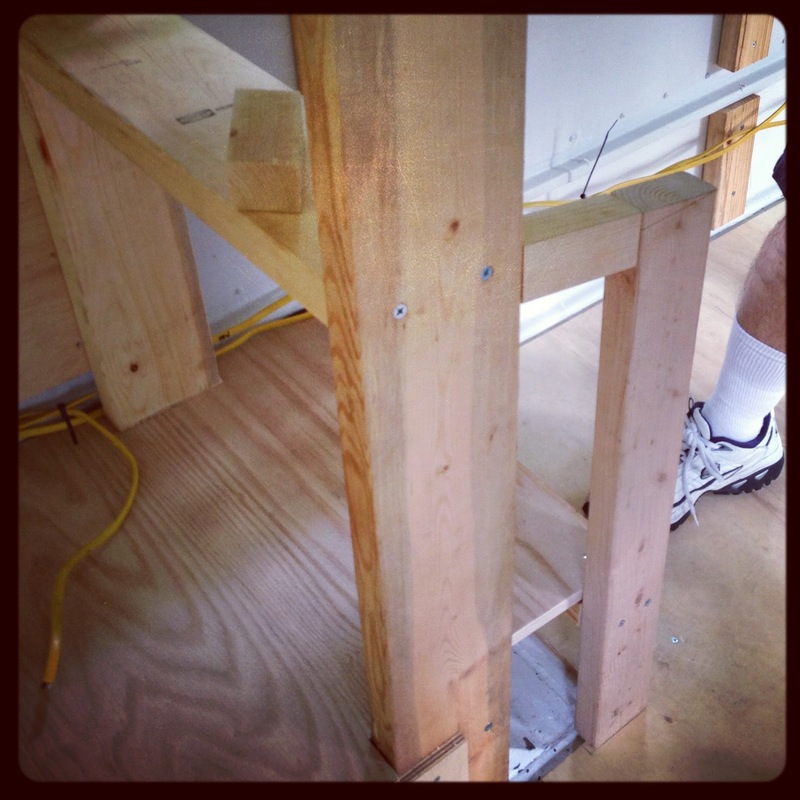 So rather than building the furniture level, we're building things parallel or perpandicular to each other. It doesn't really matter if the two closet walls are level or perfectly vertical to the ground, as long as they're parallel to each other. We accomplished this using some pretty wacky techniques like hanging string, using the laser level, and a lot of use of the t-square to ensure things are at 90* angles. 2 windows sealed up and insulated. 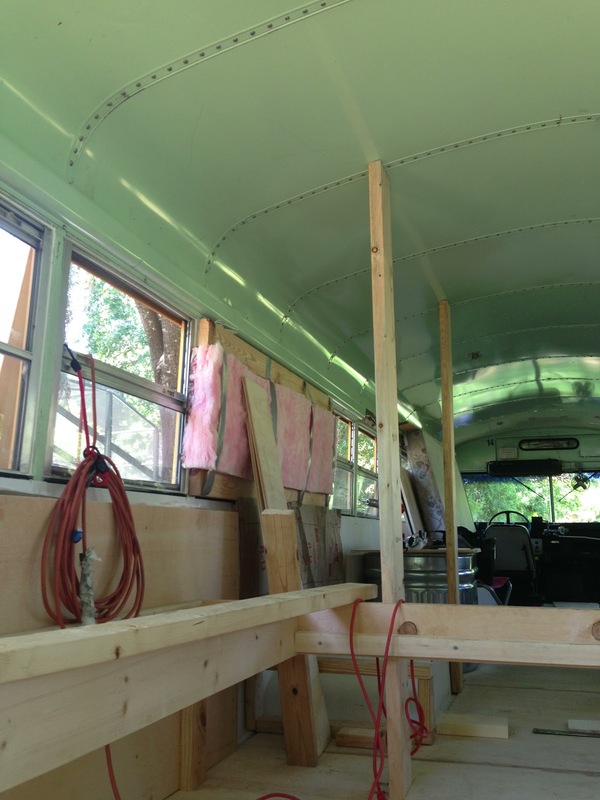 Wall plywood in place and wire chase back above the window. 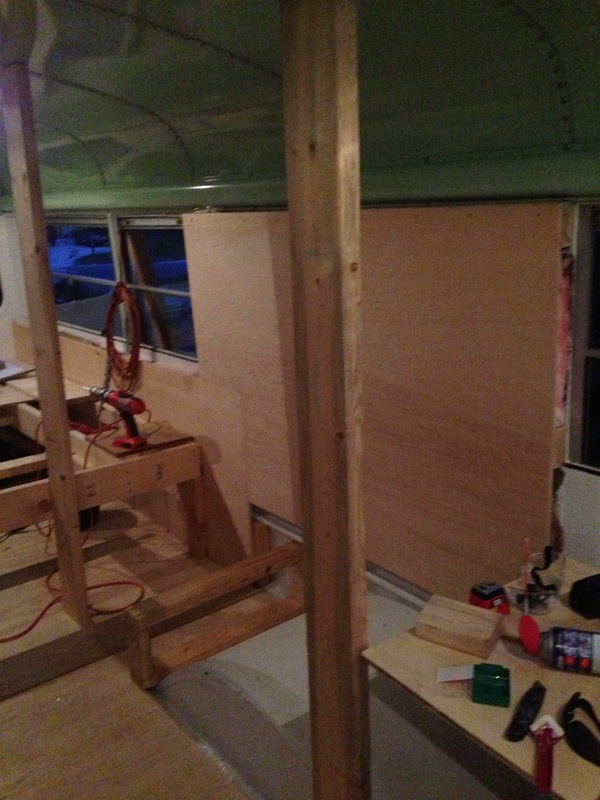 At first, we mounted two pieces of 2x4 horizontally on the walls to mount the plywood to. 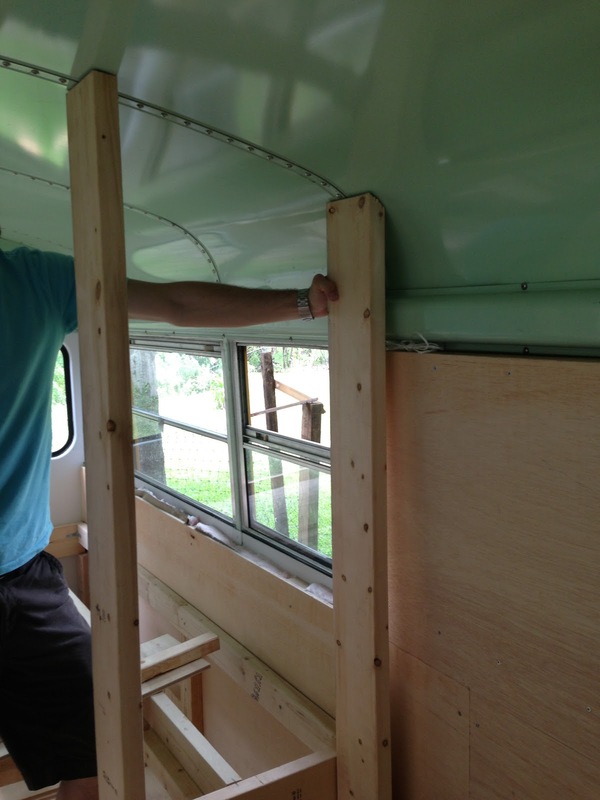 Since the walls slant inward at the top, this resulted in a serious bend in the plywood and a big gap between the wall stud and the wall. See the light shining through the gap? So after a whole day of putting the above mess together we packed up and went to bed. I had nightmares about the gap. I hated the gap. So the next day we took it all down and came up with an alternative. 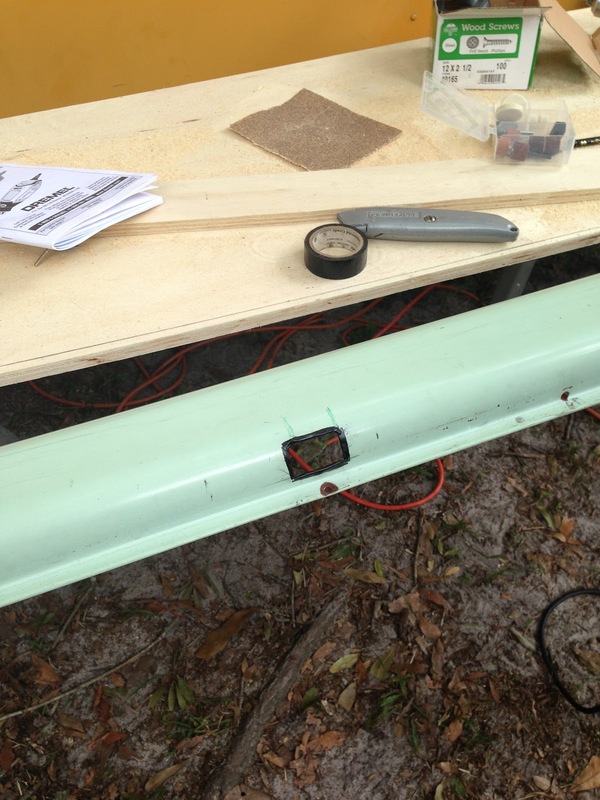 To fix the bend in the plywood, we replaced the top horizontal 2x4 with a 1/2 inch by 3 inch piece of plywood. This lessened the bend. Then, to stop the stud from hitting the wire chase, we just chopped off the top of it. Here's the new stud installed, much better! While we had the wall down, we were also able to run wire though it for the lighting in the kitchen. We drilled a small square in the wire chase so it could be threaded into it, this hole won't be visible in the closet. 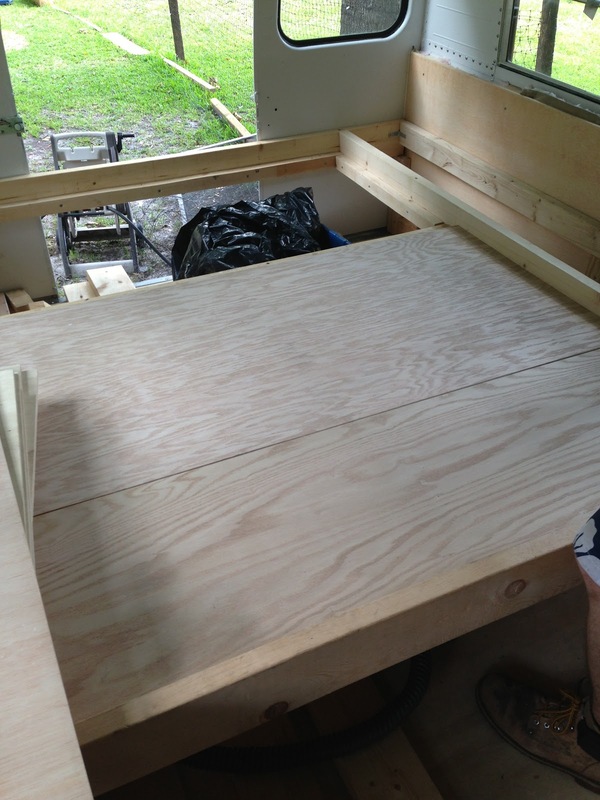 We also filled in the wheel well box with insulation and closed it up with plywood on the top and sides. This area behind the 2x6 to the right will be our hamper. Winston, Willow and Bailey all approve of the bed. 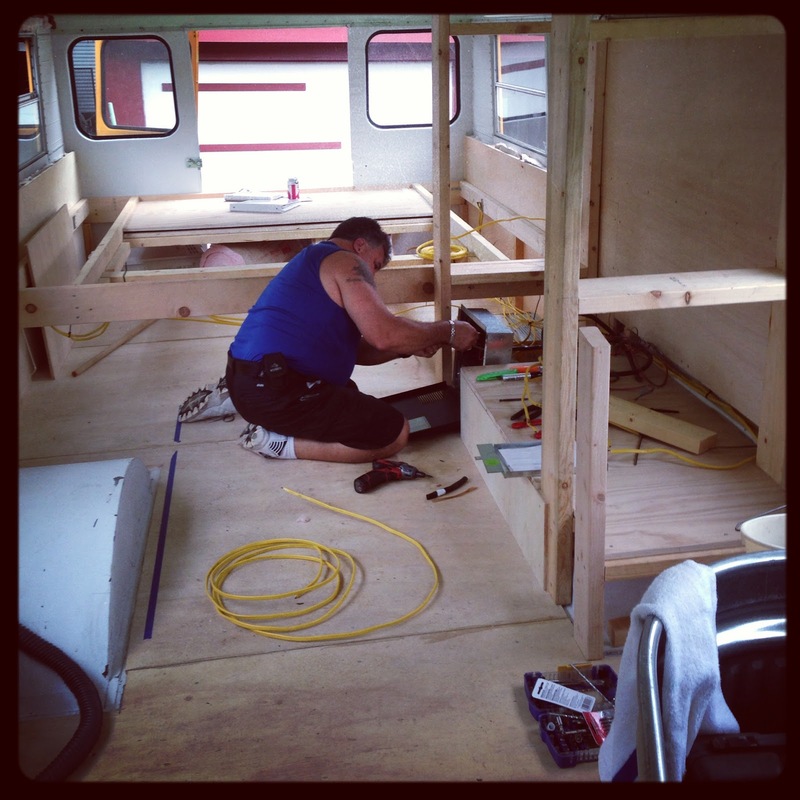 We're very happy to report we found an electrician who has 30 years of experience working with RV's. 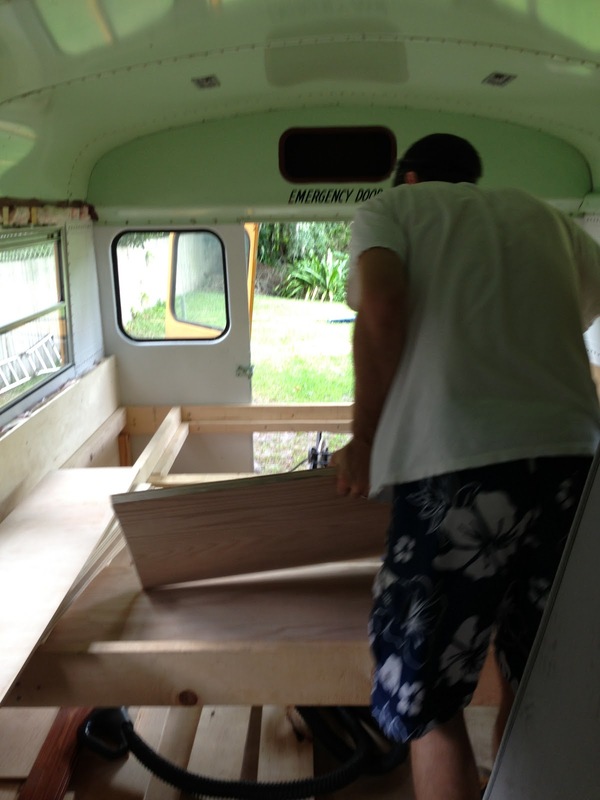 He will be helping us with our electric, plumbing and will also do some welding to hold our tanks underneath the bus. 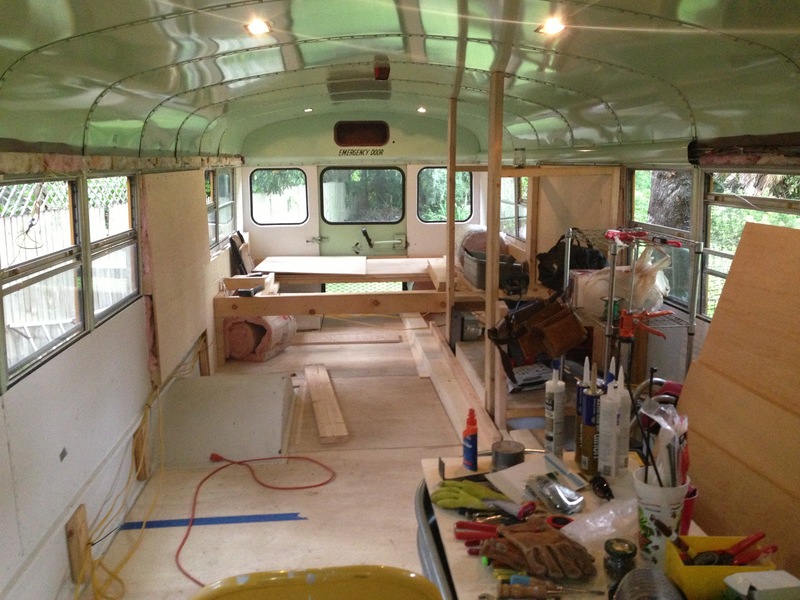 We already have all of the wiring in place for our 110 electric and are finishing up the DC wiring this weekend. The Circuit breaker box and surge protector are in place and next we get our inverter, batteries, battery panel and outlets. 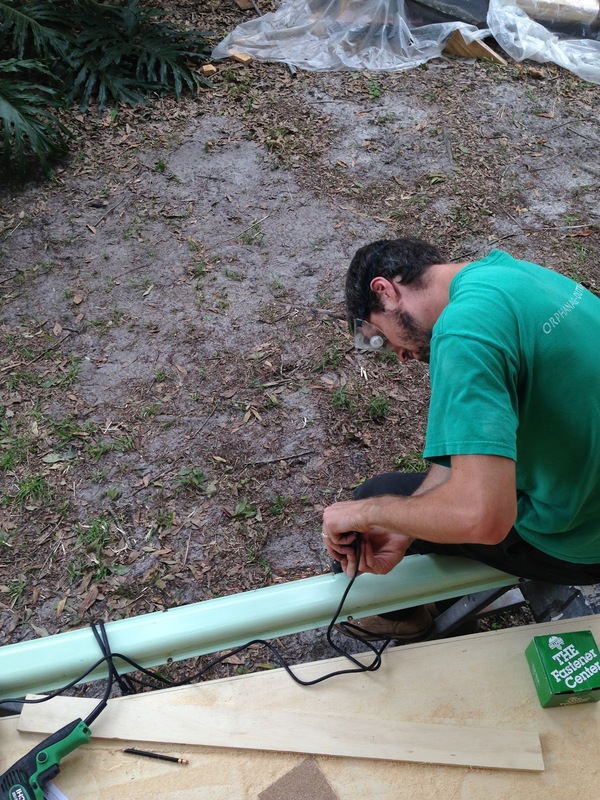 Chris will write a more in-depth post on our electrical system in the coming weeks, as that's been his area of research more than mine. 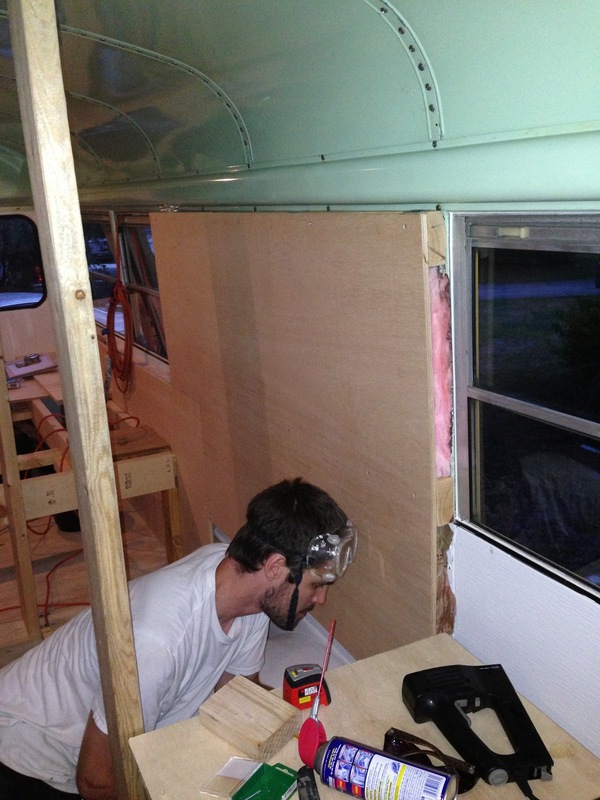 With the driver side closet of the bus almost done, we've started working on the passenger side. This is going much more quickly since we practiced it once already. This week we hope to finish the closet and the rest of the walls as well as start the bathroom and tub area. 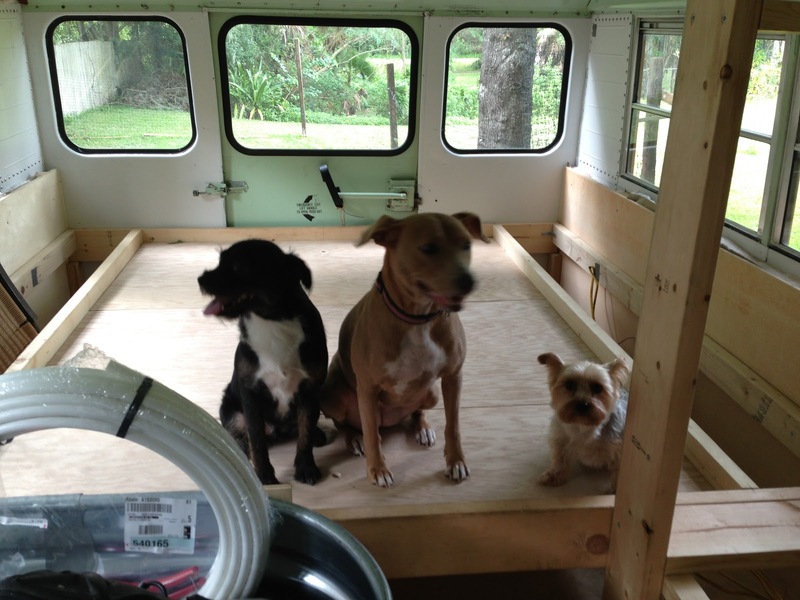 Also, our water tanks and AC have been ordered, we're just waiting on their shipment. Things are really coming together nicely! 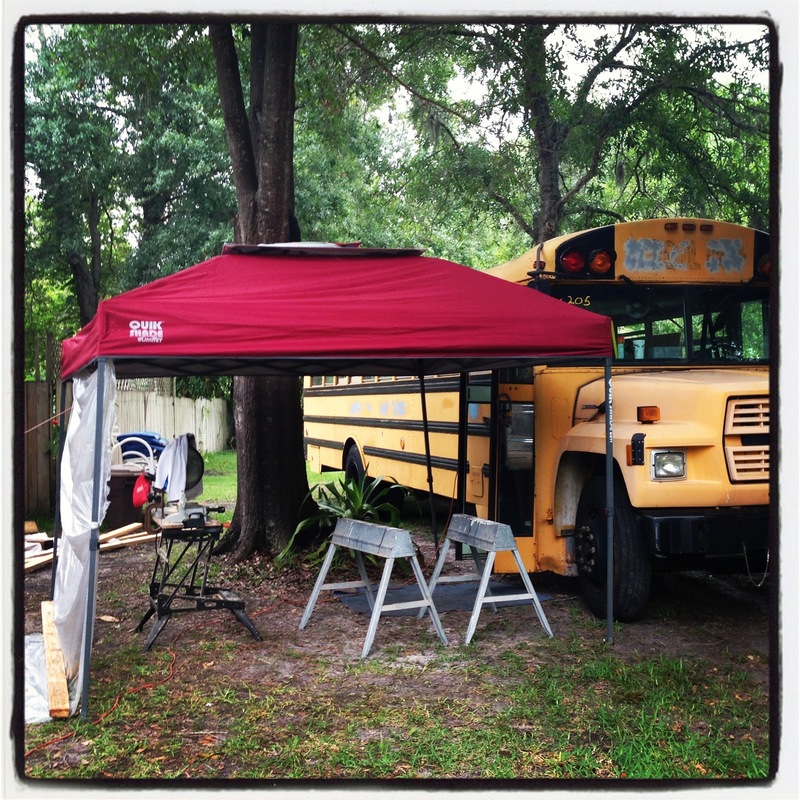 With all the rain we've been getting (it rains every afternoon in Florida during the summer) we decided to set up this tent so that we don't have to constantly bring the tools in and out of the bus. Of course, the first day we put it up a tropical storm decides to hit Tampa so we had to promptly take it down before the wind took it away to Kansas. It'll go back up once the storm passes and business will proceed as usual. Looking good and you're keeping Tom off of street corners.